August 16, 2014 Sarajevo, Bosnia and Herzegovina – Sitting in a large conference room in the new Gazi Husrev Bey public library in Sarajevo, Mustafa Ceric has replaced his flowing Islamic black garb for a snug suit and tie. A white and green woven flower – the symbol of the July 11, 1995 Srebrenica genocide is pinned to his lapel whenever he attends public events. Outside the conference room, in the auditorium, guests from around the world have arrived in Sarajevo to participate in a symposium marking the 100-year anniversary of the start of World War I. Politicians and academics have prepared speeches highlighting reconciliation and peace- concepts. Listed in 2012 as one of the top 50 most influential Muslims in the world by the Jordanian Royal Islamic Strategic Studies Centre, Mustafa Ceric, Bosnia’s former grand mufti of 20 years threw his bid in Bosnia’s general elections on October 12 as an independent candidate for the Bosniak (Bosnian Muslim) seat of Bosnia and Herzegovina’s tripartite presidency. Ceric has been considered a liberal and moderate Islamic leader but some of his statements made while serving as grand mufti have garnered criticism from secular Bosnians. He has spoken highly of Sharia law but admitted it is unrealistic to implement it in Bosnia. He’s also known for glorifying the Ottoman Empire, which ruled the Balkans for five centuries. In 2008, during a meeting with Turkish Prime Minister Tayyip Erdogan, Ceric said, “Turkey is our Mother. That’s how it always was, and it will remain like that”. Jasmin Mujanovic, a PhD candidate of political science at York University in Toronto, believes Ceric’s candidacy to be profoundly problematic. “Religious figures of his stature should have no place running for public office, especially in countries like Bosnia where questions of faith are so politically charged,” Mujanovic stated. 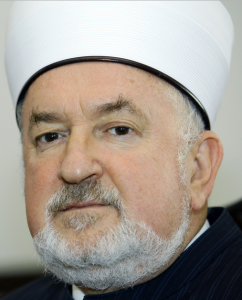 The report fails to note additional and key issues about Dr. Ceric who held the position of Chief Mufti of the Bosnian Islamic Community for almost 19 years but was replaced in September 2012. Dr. Ceric has had a long and extensive history of ties to Islamists since the time of the 1992-1995 Bosnian War including a long association with Global Muslim Brotherhood leader Youssef Qaradawi who heads the European Council for Fatwa and Research (ECFR) where Dr. Ceric is a member. Questions have also been raised concerning what have been described as Dr. Ceric’s “shady business dealings” and his efforts to placate extremists and silence their moderate critics. The GMBDW reported in June on Dr. Ceric’s decision to run for the Presidency and in April, The Telegraph in the UK cited the GMBDW as the source for their story on the Tony Blair Faith Foundation and the Brotherhood links of Dr.Ceric, one of the Foundation’s advisors.